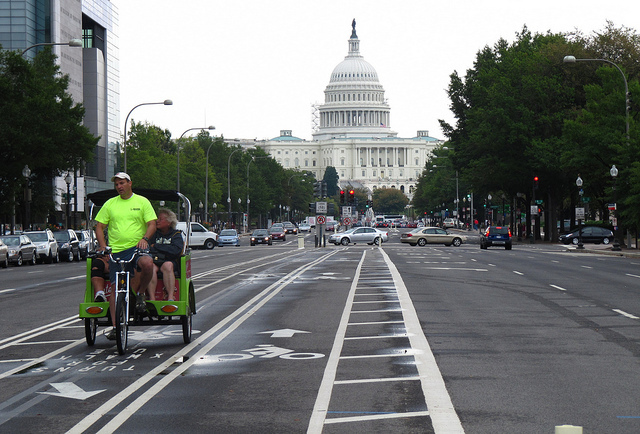 Need to make a quick run from the U.S. Capitol to Ben’s Chili Bowl on U Street by bike? HopStop stays you'll burn 165 calories and save 2.97 pounds of carbon emissions. Photo by James D. Schwartz. HopStop, the provider of pedestrian navigation and mobile transit scheduling, is introducing a new environmentally friendly initiative to its online service: a carbon emissions savings calculator. Now when you use HopStop for transit-based directions to your next destination, you will also be able to roughly estimate how much carbon you’re saving from our planet’s atmosphere. Previously, HopStop had added the amount of calories burned while taking alternative modes of transport, like cycling and walking. Now, with the addition of the carbon emissions calculator, HopStop will truly become the one-stop shop for everything transit. The carbon emissions calculator is only one of the three green initiatives HopStop is kicking off this month. The company is also partnering with The Green Restaurant Association, a nonprofit organization that certifies restaurants that meet rigourous environmental standards, to help users select the most environmentally conscious dining venues. With this initiative, HopStop will power directions to all of the “Certified Green Restaurants” within the Dine Green directory. HopStop also created a “Green Restaurants” category within its City Guide. The last of HopStop’s three green initiatives is its newest rating as a Certified B Corporation, or a Benefit Corporation. The rating is a “Good Business” standard created by B Lab that measures a company’s material positive impact on society and the environment, in order to meet higher standards of accountability and transparency. Can Urban Design Influence Driving Habits?